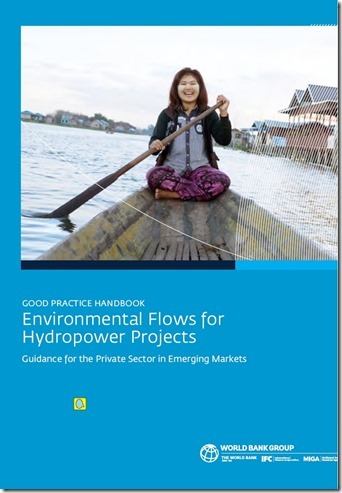 The International Finance Corporation (part of the World Bank Group) has published the IFC Handbook on good practice in environmental flows for hydropower projects. The book written by top experts in the field of E-flows and edited by the IFC describes what the World Bank Group expects to be a good practice in environmental flows planning and management in hydropower projects both for single-dam, cascade of hydropower dams and at hydropower development\operations at basin-wide scale. The manual is written for investors, agencies, project managers and decision makers allowing them to incorporate E-Flow planning into various endeavors of hydropower sector: plans for re-operation\upgrade of existing HPPS, new dam feasibility studies and EIAs, basin-wide hydropower planning, strategic environmental assessments of programs and sectors, etc. The handbook points out the problems with hydropower impacts on eco-hydrology and suggests management algorithms how to plan "solutions" through E-flow assessments. It has attachments with model terms of reference for low-medium-high resolution. E-flow assessments and contents of model ESMP (environmental and social management plan) . The Handbook contains references to various E-flow methods, but does not explain how to implement a specific methodology for an E-Flows Assessment, how to select stakeholders, how to negotiate and make decisions on E-Flows allocations, finally it does not dwell on how to implement E-Flows in practice. The book is focused on hydropower, mentioning in passing that it is broadly applicable to any other water infrastructure projects and schemes (and we testify – it is applicable) . This worrying to us, that instead of marketing its product as way to secure certain ecosystem values through E-flow management, the IFC chose to name and market its book as promotion of sustainable hydropower. Such approach makes many question IFC\WB Group attitudes towards sustainable development. Dimiter Koumanov , a very experienced river conservationist from Bulgaria, summarized his impressions from first reading: "The handbook can be used as minimal requirement, as a start point, but still needs to be much more specific for E-flows to be implemented. It is full of good intentions, but the problem is always in the details. I also think that by promoting such "good practice" guides or handbooks or whatever, hydropower is trying to promote itself as "clean energy". E-flow is not a panacea, but only a part of solution. Just come to see what the Iron Gates Hydro Unit has caused to the Danube ecosystem never mind it does not divert any water and is just blocking fish migration. The message of the handbook is that the only sustainable way to use a river is hydropower : "A successful E-Flows Assessment requires using a method that will provide the appropriate level of detail to guide sustainable development." There are many other ways to provide sustainable development of communities living alongside a river which is still untouched by hydropower: commercial fishing, tourism based on water sports, angling, rural tourism, etc. In the handbook I do not see recommendations for considering hydropower no go zones at all. Even we have such zones in Bulgaria. The message is that all the problems can always, everywhere be solved by means of the "E-flow" determination. This is a very wrong message. The book fails to acknowledge that rivers can be used in a different way much more friendly to environment than for hydropower. "-Koumanov concludes. The RwB members also found some problems reading the publication: unlike previous WB publications on the topic the book has only two case studies both concerning "success" in single-dam projects on already affected rivers. The Handbook quotes policy that "the World Bank will not finance a project that may cause significant degradation or conversion of critical habitat" and still promotes dam building in protected areas". However, both case-studies are concerned with dams built within or in immediate vicinity to national parks, which are extremely BAD precedents contradicting the very purpose of the WB policy on natural habitats. Those examples give an impression that it is permissible to encroach on protected areas and other “critical habitats” if you can show that in future the project may result in "net biodiversity gain" through mitigation efforts, "biodiversity offsets" and rich promises of good management once the dam is built. Such case-studies are ethically questionable. But what did You expect from the IFC? We agree with Dimiter, that handbook methodology can be used only as minimal requirement for new projects. The RwB believes that while the book contents is not fully sufficient to guide development of greenfield dam projects and should be complemented by analysis of alternatives and basin-wide biodiversity mapping (e.g. other energy solutions, explicit mapping of biodiversity values and no-go areas prior to development, etc. ), it is an excellent ready guide for E-flow assessments for existing hydropower dams\cascades to develop and implement plans to improve their environmental performance. The handbook may readily guide development of ESMP (environmental and social management plans) for instituting adaptive management of E-flows during re-licensing\upgrade or rehabilitation of existing dams. The manual has a special section 8 on gradual improvement of E-flows at already existing facilities, it states: "A system of monitoring, evaluation, and adjustment—commonly referred to as adaptive management—should be fully and explicitly integrated into management of a river whose flows have been altered by development or a re-operation plan." This is consistent with lessons learned by WWF, TNC and other NGOs focused on E-flows – you need to incorporate possibility of adaptive improvements in any E-flow program and develop robust monitoring system to judge its effectiveness and guide adjustments. Unfortunately, to the best of our knowledge the World Bank Group, as well as AIIB, GLC and EBRD do not incorporate mandatory E-Flow assessment, introduction and monitoring in their projects funding re-operation, rehabilitation or even "climate adaptation" of old hydropower facilities. We failed to find such studies\activities in recently funded rehabilitation\upgrade projects at Nurek Hydro in Tajikistan, Engury Hydro in Georgia, Tarbela Hydro in Pakistan, etc. The WBG and others consider E-Flow component almost exclusively to "greenwash" and make palatable to international public opinion new hydropower development projects, which makes us question the devotion of these institutions to sustainable development and environmentally sound integrated water resources management, let alone biodiversity conservation. Successful introduction and credible monitoring of E-flows at already existing facilities will show genuine intention of hydropower owners and their investors to achieve sustainability.